The fundamental paradigm of net neutrality may change soon in Europe. The well-expected Single Market Reform of Commissioner Kroes, due to be announced on September 11, 2013, will likely contain provisions on net neutrality which may substantially affect the balance between network operators and Internet service providers respectively, with a substantial impact over consumers. In the Commission’s formal intention, this reform will “introduce net neutrality”, while some stakeholders fear the opposite. Therefore, it makes sense to more deeply examine this incoming reform. In nuts and according to what we have learned, Kroes’ reform could implicitly recognize the right for network providers (including ISP) to arbitrarily discriminate and charge Internet services without objective justification – as it could be, instead, in case the additional charge is paid by the consumer as a consideration for specific levels of quality, speeds, data volumes . Honestly, Kroes’ reform is neither prescribing such things to happen necessarily, nor encouraging them. However, as long as such practices may be permitted to happen under a new European framework, then discriminatory practices will become completely lawful in the national context and therefore they could not be challenged in front of national courts or authorities. This is why, irrespective of the policy intentions of Commissioner Kroes, such scenario deserves attention. An ISP like T-Mobile could decide that Internet access will cost differently to its customers, depending on the services they intend to use: thus, it could be imposed that, amongst various music streaming services, only for one of them (i.e. the preferred one, paying T-mobile for the preference) the Internet connectivity will be free, while for other services the customers will have to pay the connectivity. To better understand the impact of this mechanism, imagine that going to restaurant involves the payment of a roadtoll, which may vary depending on the arbitrary preferences of the road authority: the choice about which restaurant to go will not depend on the quality of the same, but rather on the costs to be paid to achieve the location. Going back to Internet and telecoms: in a environment tending to data volumes and caps (i.e. the customers pay for a maximum amount of data to be consummated, while for the exceeding part an additional fee will be charged), this mechanism will fundamentally influence the choices of consumers, who will select services not only on the basis of the intrinsic features of the preferred service, but also depending on the cost of the Internet connectivity necessary to access to it. In the case of music streaming, since such kind of service requires high consumption of Internet connectivity, consumers will be naturally induced to opt for the free-connectivity services, to the detriment of others (even if the others are better in terms of quality, variety of offers ecc). The same may happen for services requiring heavy bandwidth such as video streaming, but also to other services sensible to latency and other quality features (VOIP, gaming ecc). Truly speaking, the problem already existed, since to time there were no rules clearly preventing European ISPs from differentiating the cost of Internet connectivity in order to discriminate Internet services (with the exception od antitrust rules, when applicable). However, European ISPs have been normally cautious in this respect and only some of them have enforced such practices, normally vis-à-vis VOIP (some mobile operators charge or even block access to Skype, while they exempt their own VOIP services from connectivity fee) and music streaming services (see Spotify in Germany and Sweden, as well as Deezer in France). One could therefore argue that this reform will just formalise an existing reality, without substantial impact for the market. By contrast, this aspect of the reform may have a strong impact indeed (if my worst interpretation is confirmed however). Fact is, until now the discrimination practices from network operators have been limited in number and extension by the threat of intervention by legislators and regulators, urged by consumers and civil rights associations opposing such discrimination practices for various reasons. Consumers and civil rights activits fear that a non-neutral Internet will be detrimental not only for business and entertainment, but also for civil freedoms, because the ability of network providers in discriminating Internet services could also be used to make difficult access to websites, forum and services of political relevance. As a consequence, there is a public opinion pressure over legislators to limit such discrimination ability. In some countries this pressure resulted in legislation prohibiting discriminatory practices (the Netherlands) or granting powers to national regulators to address the issues (Slovenia). Dominant network operators have been actively militating against such legislative interventions. Now, the question is whether the effect of the Kroes reform will ban the Dutch and Slovenian legislation on net neutrality and whether national Parliaments will be still able to intervene again in such field, because they may contravene a European regulation. In the worst scenario, European network providers will be finally free to discriminate Internets services without potential deterrence, because the threat of intervention by the national Parliaments or by governments/regulators will be lifted. The only obstacle for network providers will be the application of competition rules vis-à-vis anticompetitive practices, an instrument which however is not realistic in oligopolistic market like telecoms (especially for mobile), because collective dominance is very hard to enforce. In other words, network provider will be able to discriminate Internet services without limits, instead of now. Will “best-effort” Internet access survive and be a solution? In the current draft regulation there is neither explicit nor clear reference about the obligation for ISP to provide a best-effort Internet offer at a price which is lower than special connectivity services. To time, it is only stated that best effort should not be “substantially” impaired by special connectivity services. This means that network providers could probably be able to stop offering best effort Internet service or they could offer it at economic and quality conditions which are not conveniente for consumers. It could be sufficient that the final regulation provides for a clear obligation of non-discrimination for ISP and network providers vis-à-vis Internet services, in the sense that the price of the Internet connectivity cannot be differentiated depending on the services running throughout it, unless specific circumstances can justify it, such as differentiation of quality, speeds, capacity ecc.. This means that different connectivity prices could be lawfully charged if they reflect objective quality difference and do not discriminate amongst specific service. In other words: it is legitimate for an ISP to charge extra fees to provide special connectivity for video streaming, provided that the user paying that extra fee can access any kind of video streaming service over such connectivity. By contrast, it would not be not legitimate for an ISP to charge different connectivity fees for different services, without objective justification. In addition, the draft regulation should provide for an Internet best effort offer at prices lower than special connectivity offers. There is anything good in this net neutrality reform? The intentions may be good, however the bugs emerging by the draft rules will require further thoughts by the Commission’s offices. In addition, the wording of the draft regulation is somehow misleading. In facts, the term “freedom” (“end-users have the freedom of such and such ..”) instead of “rights”, does not mean very much in legal terms. In practice, only network providers and ISPs are free, because it’s up to them to make the Internet access offers they like, while the consumers only have the “freedom” to accept such offers or not. 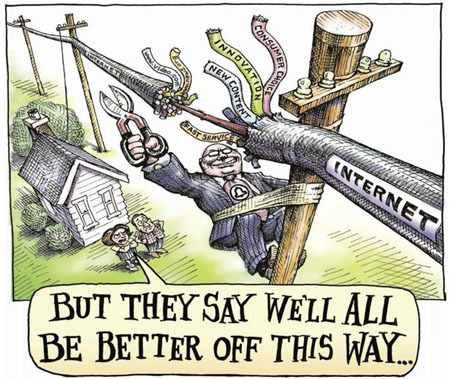 Since this reform may (implicitly) authore network providers to limit or cancel best-effort Internet, as well as to charge Internet services arbitrarily and unilaterally, then the freedom granted to consumers may finally result in just the freedom to have Internet (at the unfavorable conditions indicated above) or not. At the very end, this is the freedom not to have Internet. Why Commissioner Kroes is doing so? Commissioner Kroes is a genuine liberal; she believes that a fully unregulated environment will deliver the best results, and competition rules will address any potential problem. In addition, the Commission’s offices likely heard the claims of dominant network operators which are complaining about declining margins in the telecom sectors and intend to extract money from OTT operators somehow. The intriguing situation is that this reform is presented as something good for net neutrality, and this ambiguity is risky because the public opinion may feel cheated and could react in whatever way. The lesson of ACTA has not been learned yet by the Commission. If the worst scenario is confirmed, the first victim of this reform will be innovation. Once European network operators have learned that they do not need to be innovative to get more profits, since it is sufficient for them to arbitrarily charge Internet service providers, then innovation will become an optional. Network providers have been always claiming that a net neutrality reform would allow them to innovate, however it is hard to see something innovative in pure commercial tariffs like: service X is my friend and will pay 1, service Y is not my friend and will pay 2, and so on. Network providers will become mere gatekeepers, and their Internet charges will become similar to unreasonable Middle Age tolls, like the “Un Fiorino!” of Troisi and Benigni in “Non ci resta che piangere”. I agree. However I strongly doubt that many Member States will accept the Kroes’s proposal. Not because they all truly believe in the Internet neutrality, but because it would take away from them, as you said, the power to set their own Internet policies. And considering that in this period the EU is not so popular across Europe, I don’t think that those governments will accept to incur the risk to be criticized by public opinion for giving away other power to the Union. That said, it is important to follow the debate that will develop on this subject in the next months in order to keep stakeholders and public opinion informed.